I used to play Magic The Gathering, then turned collector when I was in high school. It really became an addiction towards the end though! So recently I dug up my old collections and an idea struck me. Why don’t I design and 3d print a custom deck holder? With a lack of better way of describing it. 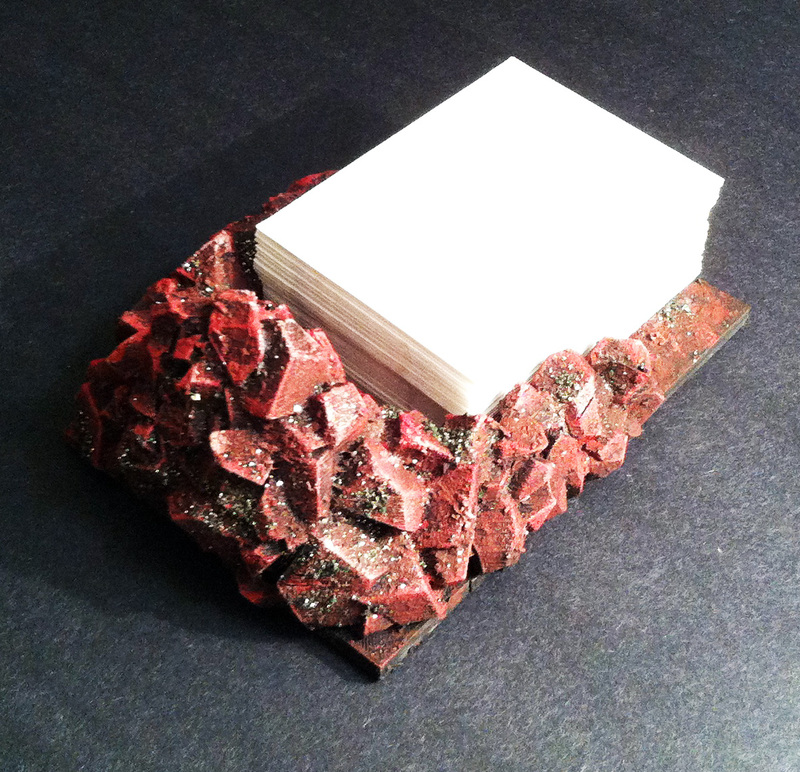 Basically what I meant was something to hold the draw deck, this 3D Printed Mountain Trading Card Deck Holder – Mountain was born. Since I’ve been dealing with mountains for some time, I thought it would be easier for me to start with the red color first (by red I mean the red color in the game). A reddish mountain made total sense! 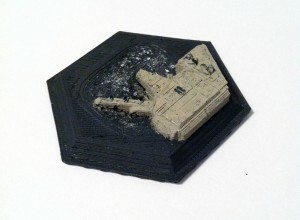 Once all 6 pieces are printed, I first primed them with flat black. 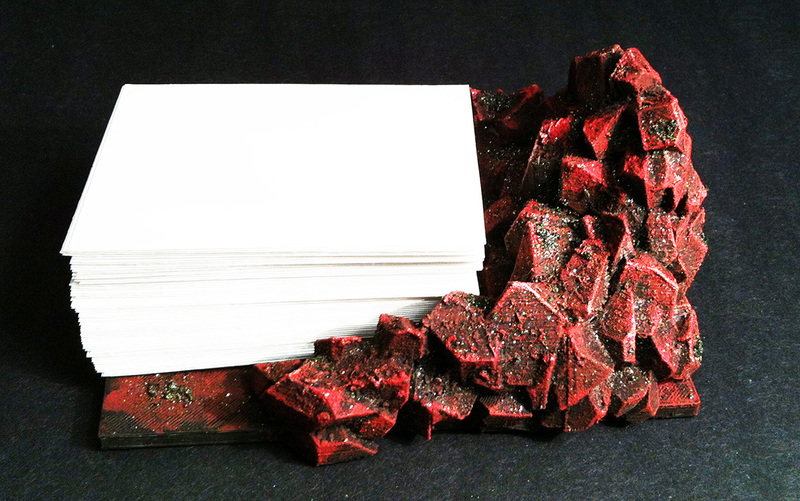 Then sprinkled the first round of flocking (with some being shiny to give it a more mineral/mine-ish feel) all over (I shouldn’t have done it in the area where the cards will be slid in since that might damage the cards/card protective sleeves). 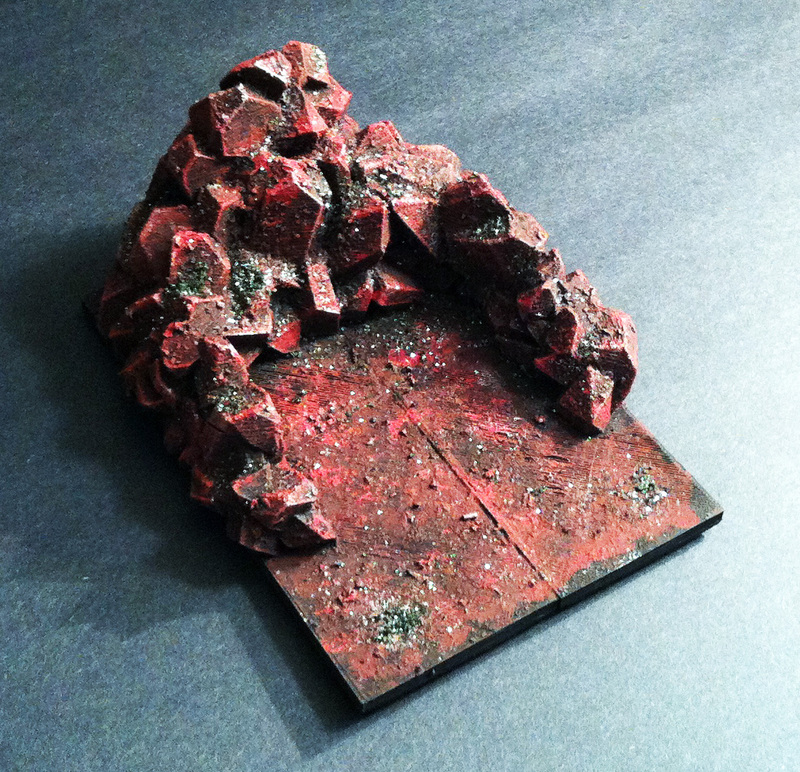 Then paint the second layer with dark red, dry brushed with slightly lighter red and finally one more layer with an even lighter red. Finally some silver here and there. It turned out pretty nicely though the first prototype was a bit tight on the sides when trying to slide in the full 60 deck. I have since tweaked it to have wider space in the middle. 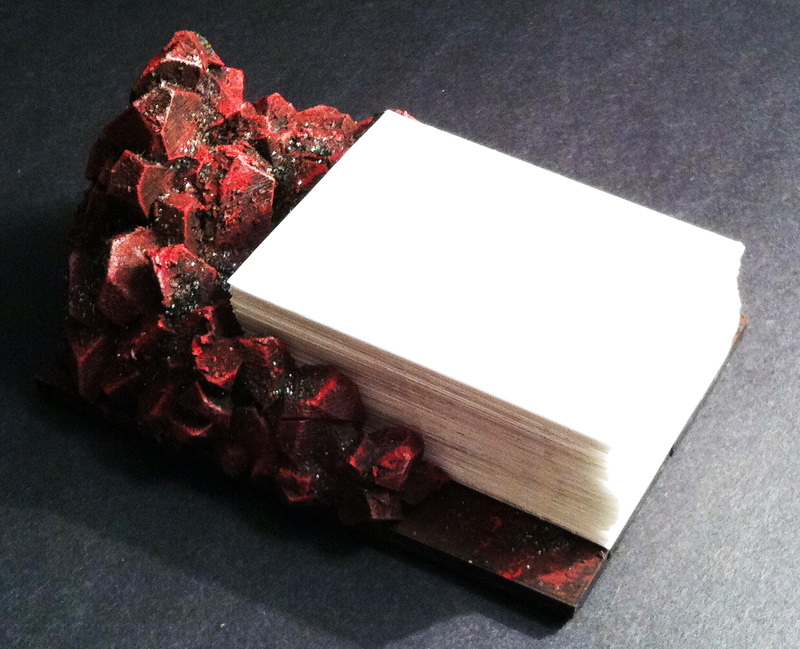 It really is not limited to just hold Magic cards but also business cards or any other cards. To my surprise, it was pretty well received on both reddit and Facebook. One of my customers who bought this told me this was shared on Magic The Gathering Rocks My World with almost 900 likes and more than 200 shares. I know this might not mean much to some but this does mean A LOT TO ME and will inspire me to continue making what I love making! I have actually finished designing the Forest version of it but too busy printing the deck holder for 2 customers! 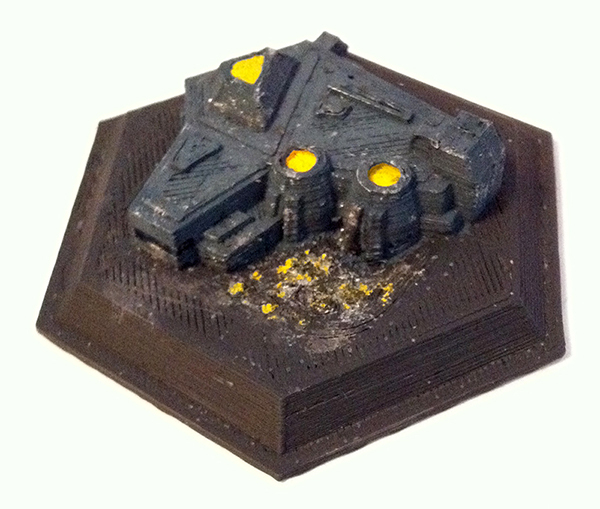 I seriously need to buy one more 3D printer to help out. 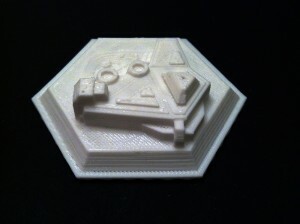 I am currently eyeing on the MP Select Mini 3D Printer and will be getting it hopefully in a few months! 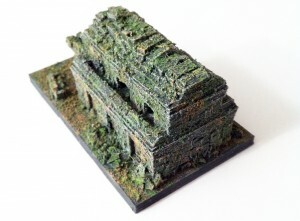 My latest 3D Printed Golden Temple Ruin Miniature partly reuses the model from my second Ta Prohm Inspired 3D Printed Temple but in a broken down and crumbled state. 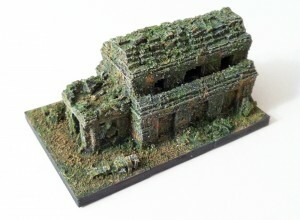 The ruined temple is partially buried hidden in the rocks and beautiful grassland. 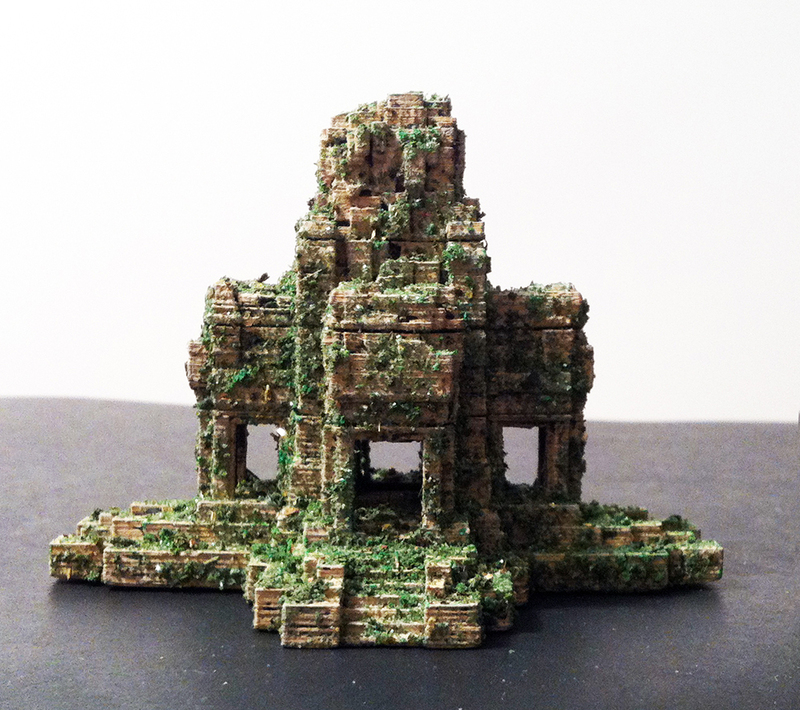 Also wanted to share the painted model the 3D Printed Ruined Temple, for a customer just a few days ago. I’ve added more flocking and the added vines make the building look even more realistic in my opinion! I’m so glad I found these crafting vines from a random dollarstore. What do you guys think? Its the time of the month, a post is wayyyy overdue! 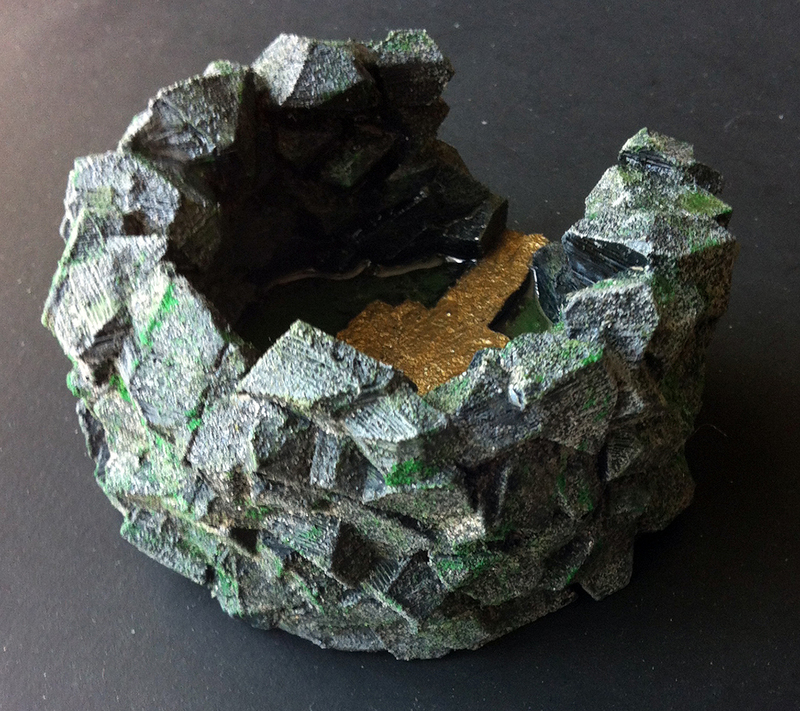 This is my latest piece – a 3d printed underground spring miniature with the use of acrylic water for the very first time. And it was fun but also very STICKY! I guess since the acrylic water was meant for use of floral arrangements or whatever the art is called. 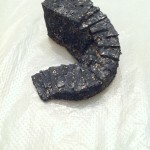 It is quite sticky even after almost two weeks of curing. I guess it is not meant to be used in open areas where your can easily come in contact with the “water”. Where as if you use this in a vase then there is pretty much no chance for you to be able to touch the “water”. So lesson learned, next time I will be extra careful about spilling the water all over the model, particularly the base because you don’t want the base to be sticky and get it glued to your work table. 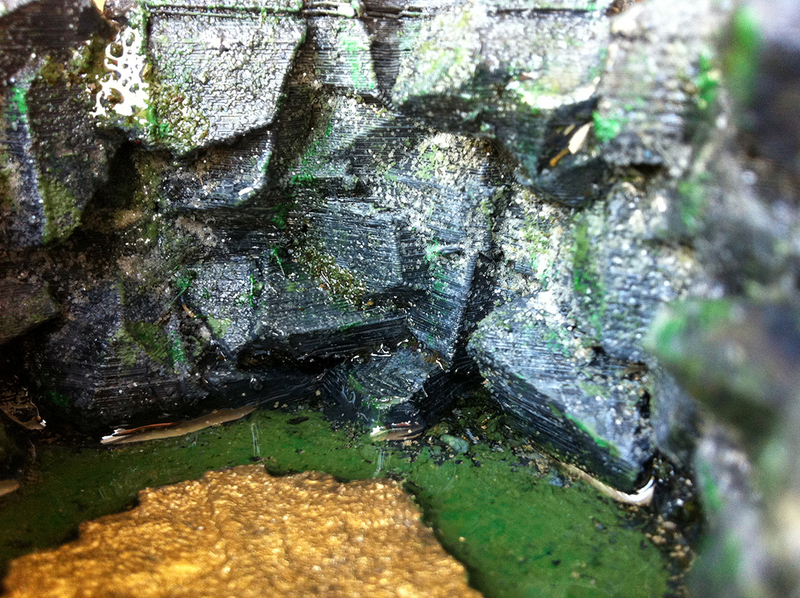 Also very important is make sure the bottom area is enclosed otherwise the “water” will sip through the gaps and leak to the bottom and that’s how you get sticky base. If you don’t have it enclosed, I think that’s fine too as long as you have something to enclose it temporary then remove it once it is I would say 50-60% cured where it is hard enough to stay where it is instead of moving around. 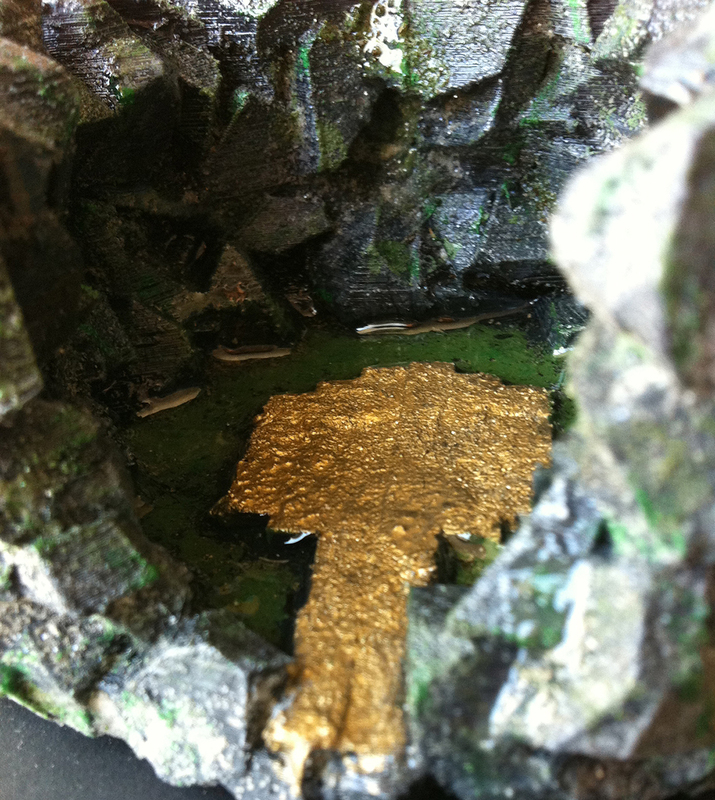 In case you ask what on earth is the golden part, it is actually a platform that holds minifigures with 28mm bases. Luckily at the time I took these photos the sun was up at the perfect spot with good amount of natural light so there was little to no post processing needed. Once again, the importance of lighting when taking pictures! All in all, it was fun as I got to learn and play with something new. Hope you guys like it! It is available on Etsy for those interested! I swear I am getting too lazy to update my blog these days…. 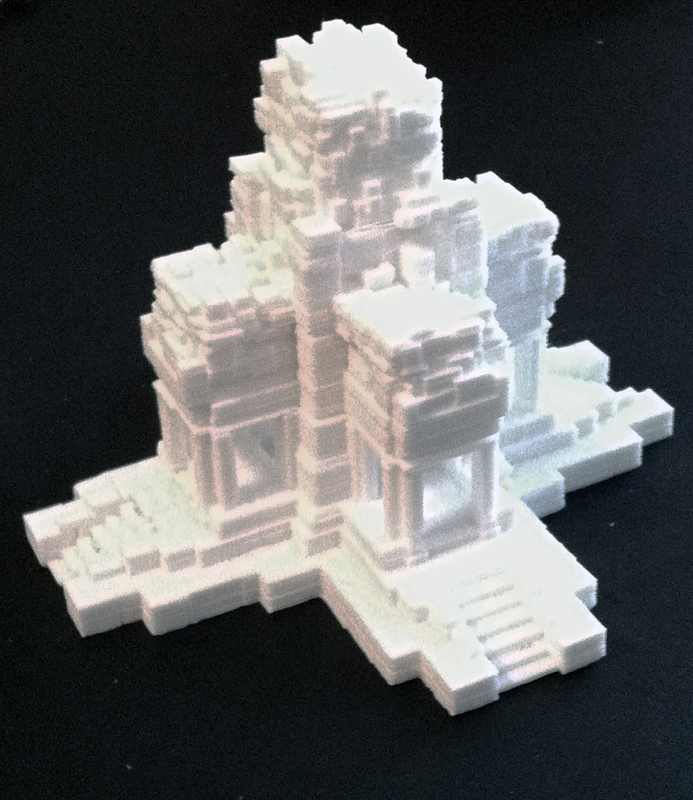 This 3D printed ancient pyramid in the sky was actually finished almost a month ago which took around 24 hours to print all 4 parts measuring approximately 8.9cm tall by 9.6cm wide by 9.4cm deep. 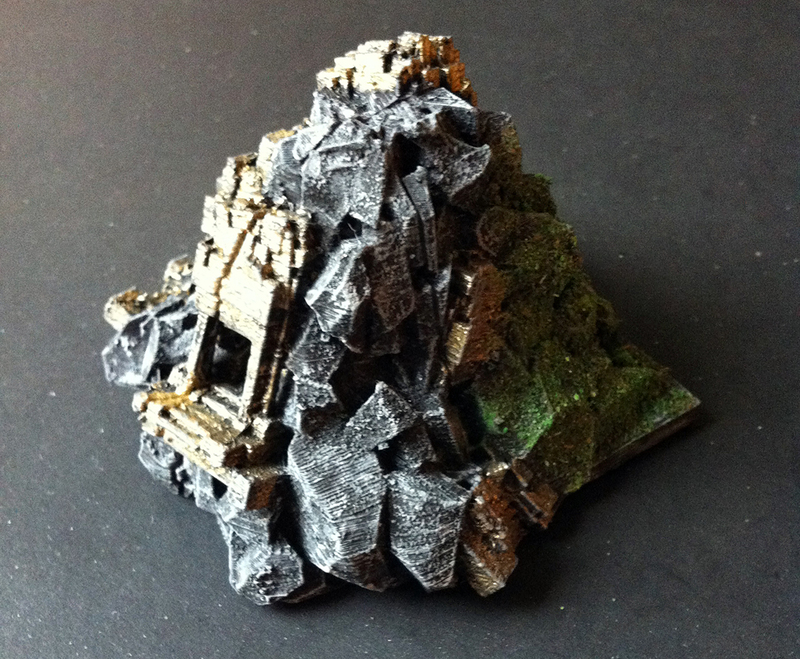 The idea was inspired by one of many classic Japanese anime – Laputa Castle In The Sky. The pyramid design proved to be relatively more challenging than my previous designs due to the fact that it is an inverted rock mountain. 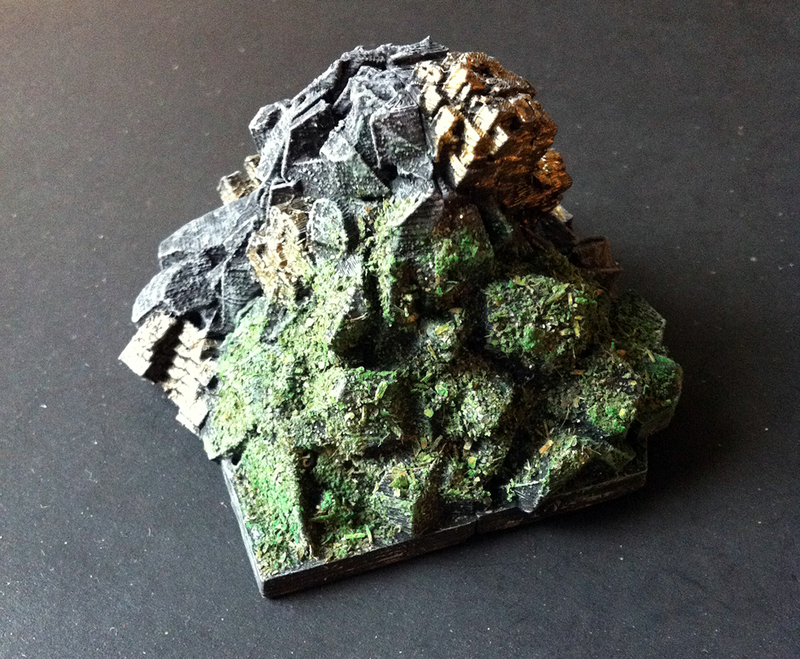 My initial design of the bottom of the inverted rock mountain was not enough to support the rest of the mass on top. 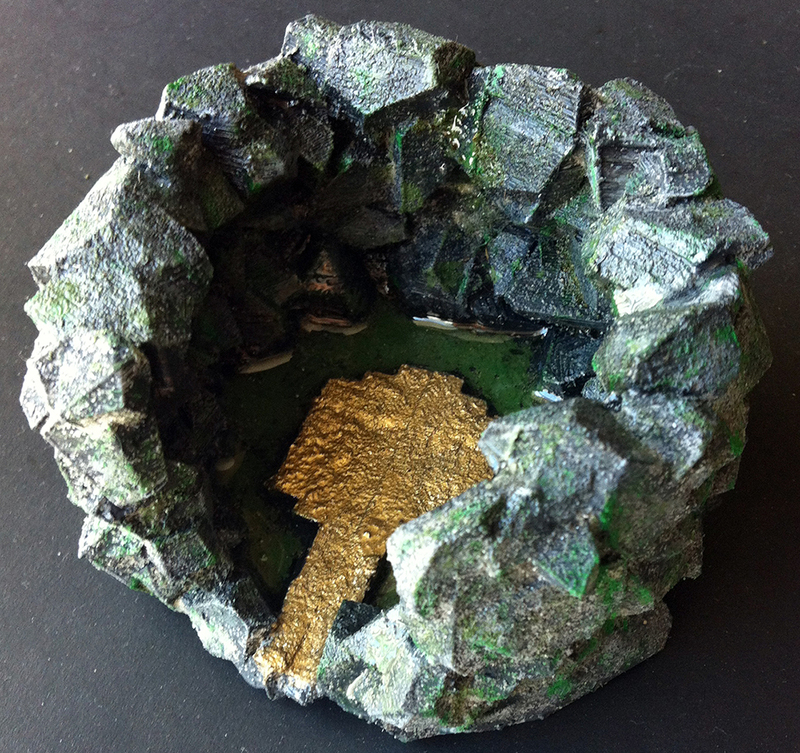 Then an idea popped up, all I had to do was create a bigger base to support the rest on top right? Well it just wouldn’t look nice or make sense at all because its an inverted rock mountain and being inverted the tip of the mountain should be most narrow. 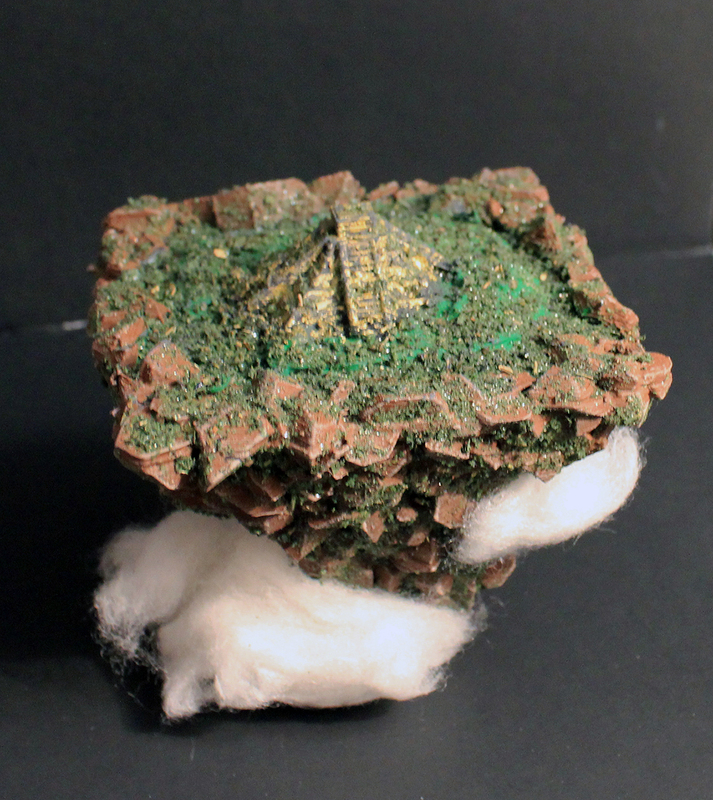 What I did was wrap the bottom of the base with 3D cloud, not bad of an idea huh? The cloud acted as a counter weight and now the model could stand on its own. Like I said before, it took around 24 hours to print all 4 parts, that was just the first step (though the longest step). I then had to glue them together, paint and weather the whole thing which took another few days. 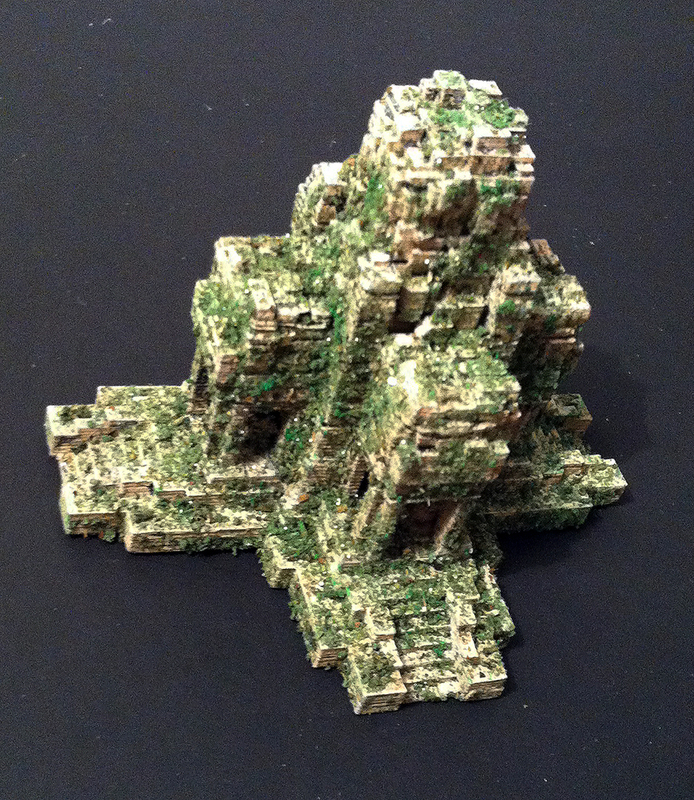 This model almost used up all my green flocking as I wanted to give it a bushy and over grown feel to it. Though it didn’t really capture that bushy feel like in the anime. 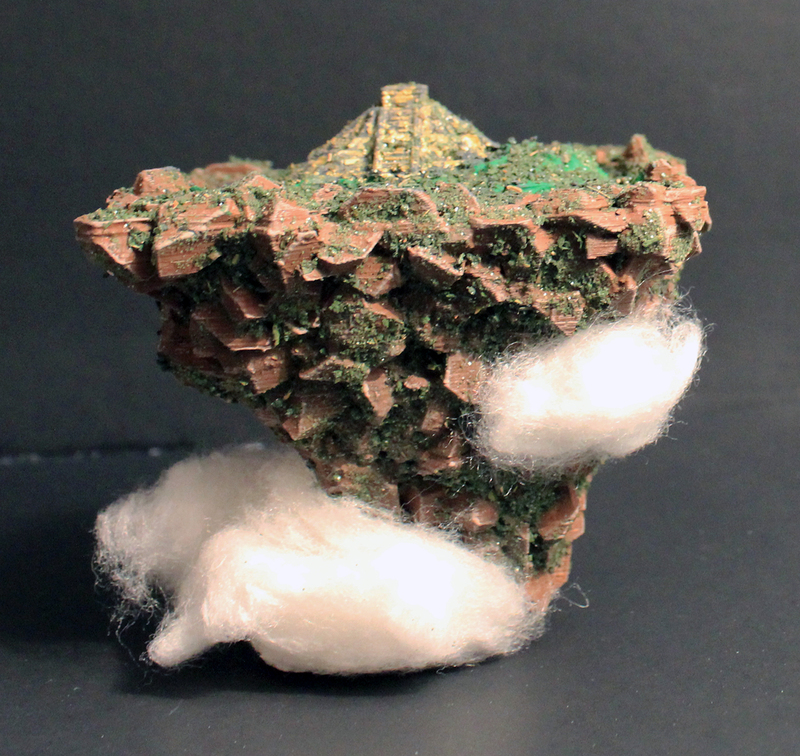 After I finished with all the painting and weathering I used some cotton balls as clouds around the base. Originally I wanted to just paint the 3D cloud but I thought the cotton balls would give much better cloud effect. In the end I was pretty happy with the result and more experience gained! 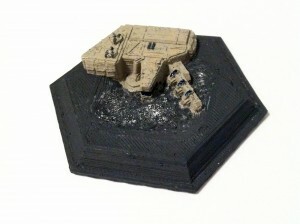 The model is available painted or unpainted on Etsy if anyone is interested! Going to take a short break and I will get back to make more fantasy miniatures! 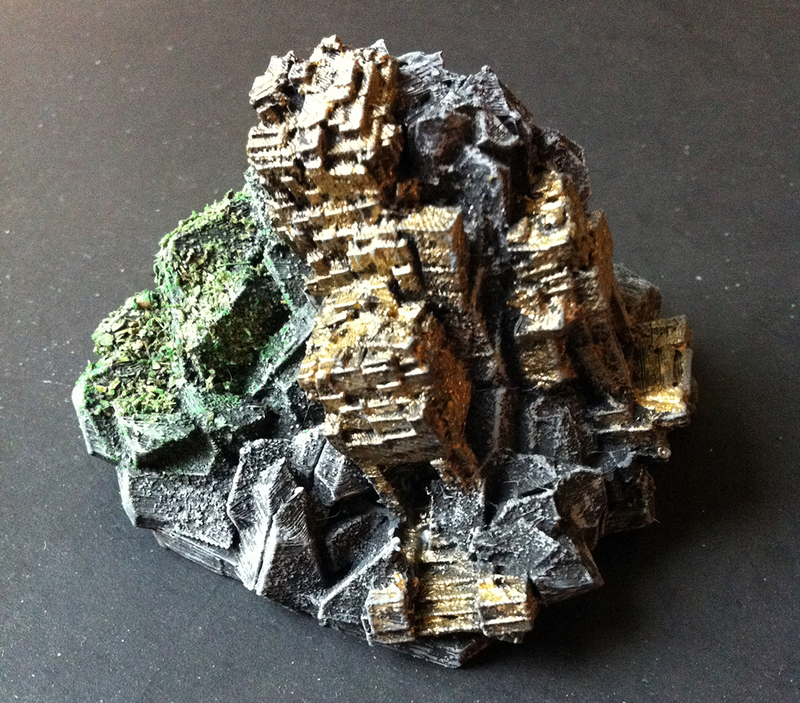 More 3D Printed Fantasy Miniatures Coming! 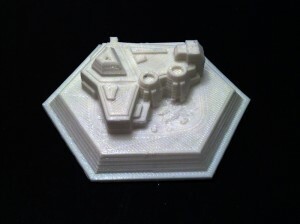 I’ve been designing and 3D printing fantasy / medieval miniatures for almost a month now and I find it amazing because my focus has always been sci-fi space ships, ships, or anything military. 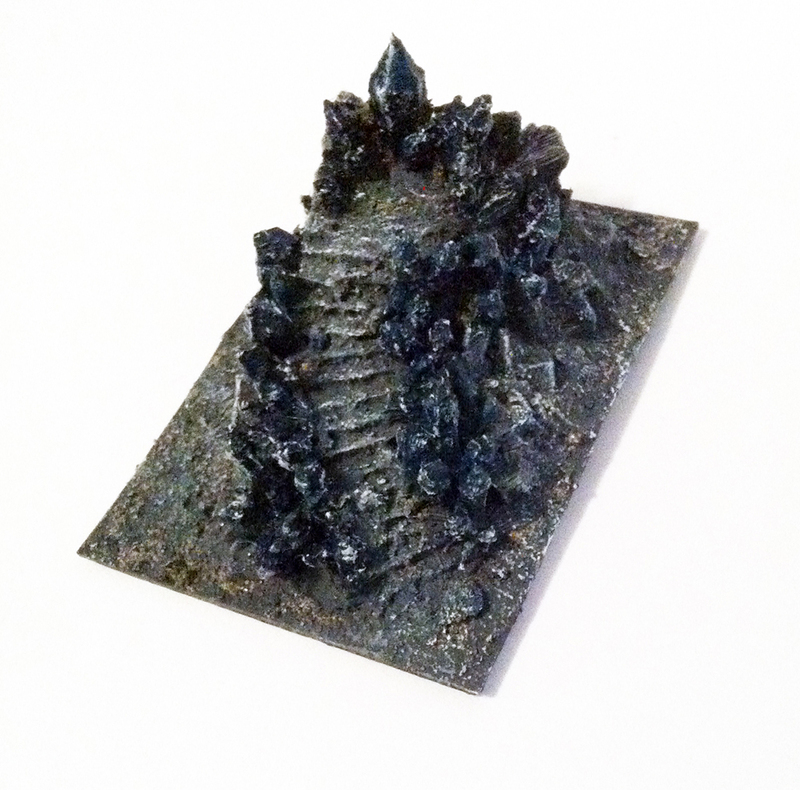 Ever since designing the very first 3D Printed Ancient Medieval Stone Stairway I have been absolutely in love with designing more and more of this type of miniature. Not only that but I have started enjoying more crafting as well. Right now its mostly just creating my own sand and grass flocking by mixing those white pixie dust that you can get from dollar store or ebay with acrylic paint. 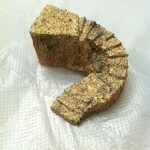 Grind them down into finer size after letting them dried overnight. Lately I have been creating the flocking using green tea bag instead of the pixie dust and let me tell you in my opinion it is much better. Why? You ask. Well first, they smell good! Second, unlike the pixie dust, the content, or the leaves from the tea bags are not uniform in size as well as having different colors. So technically you can use them right out of the bags. I prefer dipping them in some forest green or other variations of green or sand color to further enrich them with more colors but that’s just me. Now some updates on what I am working on. 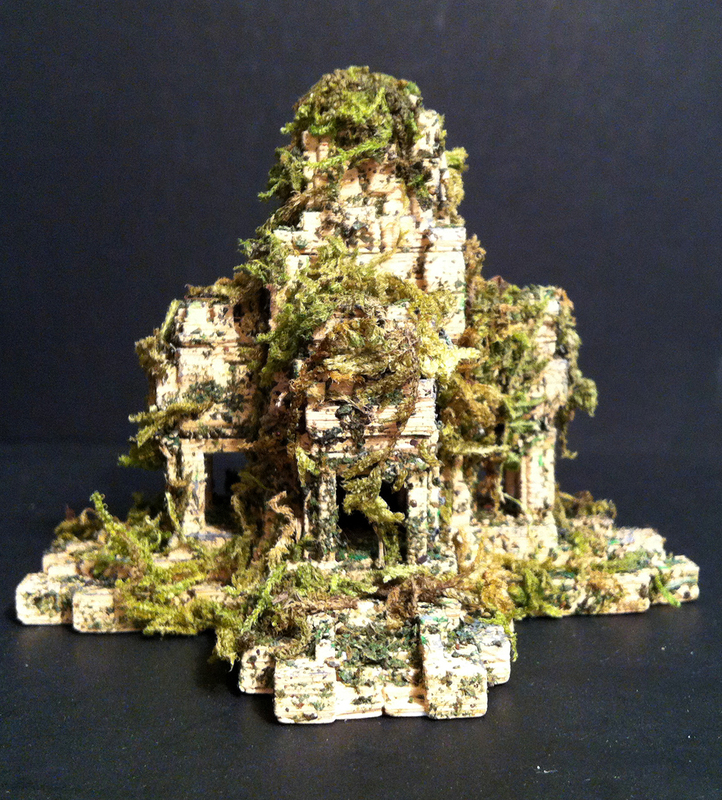 I have been working on a ruined temple heavily inspired by Ta Prohm in Cambodia. Man when I first discovered Ta Prohm, I was fascinated by the structures in the area. Though the buildings are now all broken down in ruins, they still look amazing to say the least. Some of the scupltures of figures can still be seen clearly. You guys should check it out if interested. 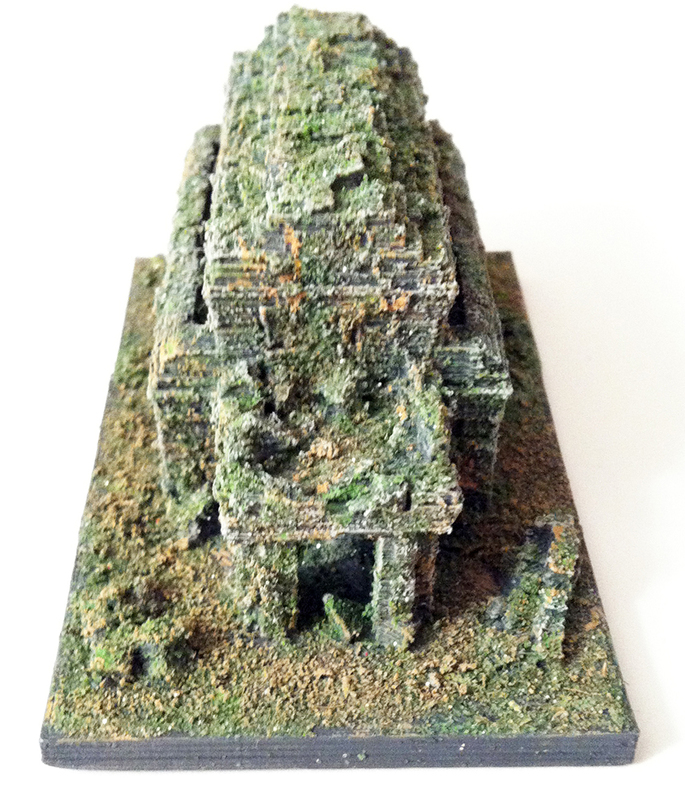 And let me cut to the chase and show you guys the temple I am working on based on temples from Ta Prohm. I will be 3D printing prototypes soon! Did I mention each of those bricks were rotated, deformed, displaced and/or decimated manually? 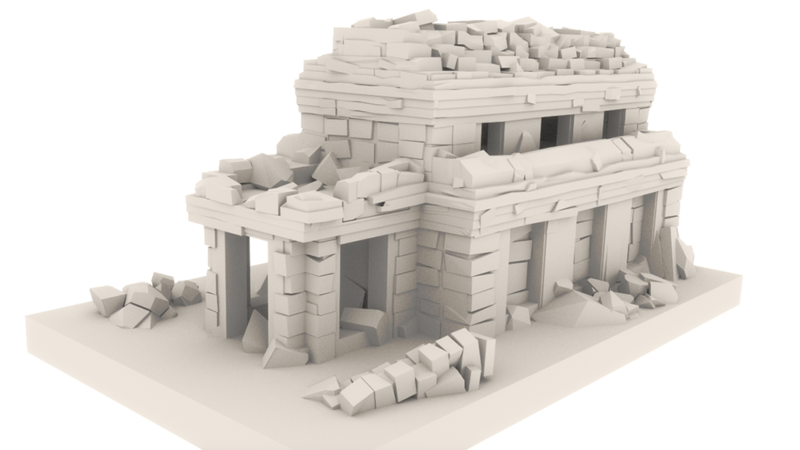 After having quite a success with the first ancient stone stairway, I have decided to design my second variation of the first. This time it is bigger and better. This ancient ruined stone stairway is surrounded by a crystal field. 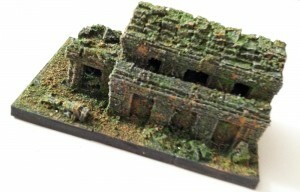 At first I was going to This also would make a great addition as a center piece on any sci-fi / fantasy / medieval war gaming scenery / battefield. I have painted quite a few miniatures so far and although I am far from an expert, I am getting a hang of how to really bring out the details of the design. Similar to the first design I first applied some white glue all around and sprinkled some sand flocking. After it has dried I primed it with a dark grey and when the base layer dried off I then dry brushed a lighter grey and then an even lighter grey on top of that to bring out the details. 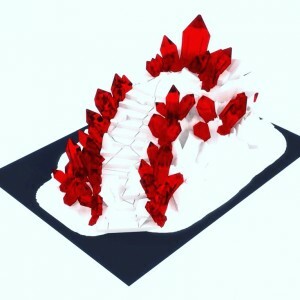 For the crystals, I initially wanted to use a bright red because having a dark grey will really bring out the bright red. But at the end I went with the metallic blue from Tamiya instead then dry brushed with white to give it a more crystal-ish feel. Again very happy with the results and I have received quite a lot of feedback and likes on 3D Printing and DM Scotty’s Crafts groups Facebook. 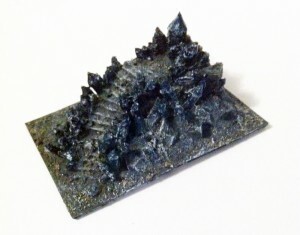 The 3D Printed Ancient Medieval Stone Stairway is approximately 3.3cm tall by 5.1cm wide by 7.3cm deep and available on Etsy unpainted as well as painted. I cannot believe it has been more than a month since my last post! Haven’t had a chance to sit down for some 3D graphics for quite some time. 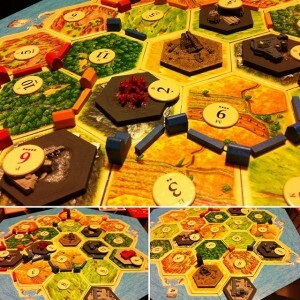 Ever since I have started working on the Settlers of Catan pieces I know this is what I really the next thing for me to explore – designing tabletop miniatures. I am very proud of the Catan pieces! 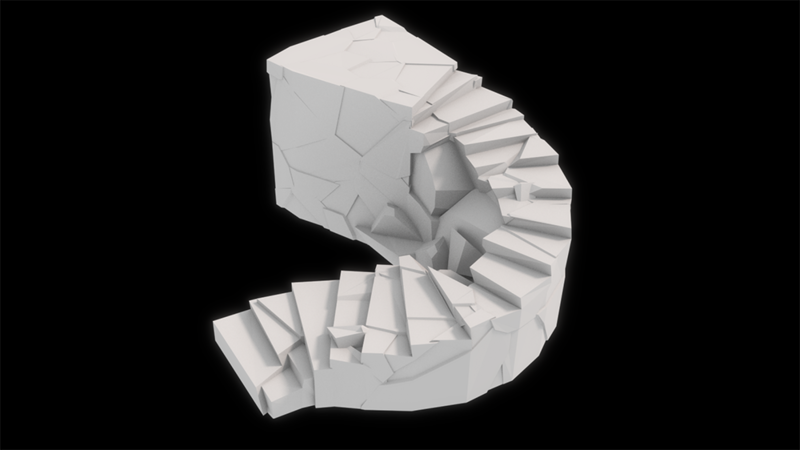 Now those pieces are done, I have decided to design my first medieval stone stairs/steps that is partially ruined and crumbled. And I love how it turned out, again as my first ever design of a stairs. Creating it was not as hard as I have imagined and it was not a big model to begin with. If it was bigger and longer then that would be a different story. I would definitely look into designing a more epic one though! Painting it presented to me another challenge as it was my first time painting structures made of stone. 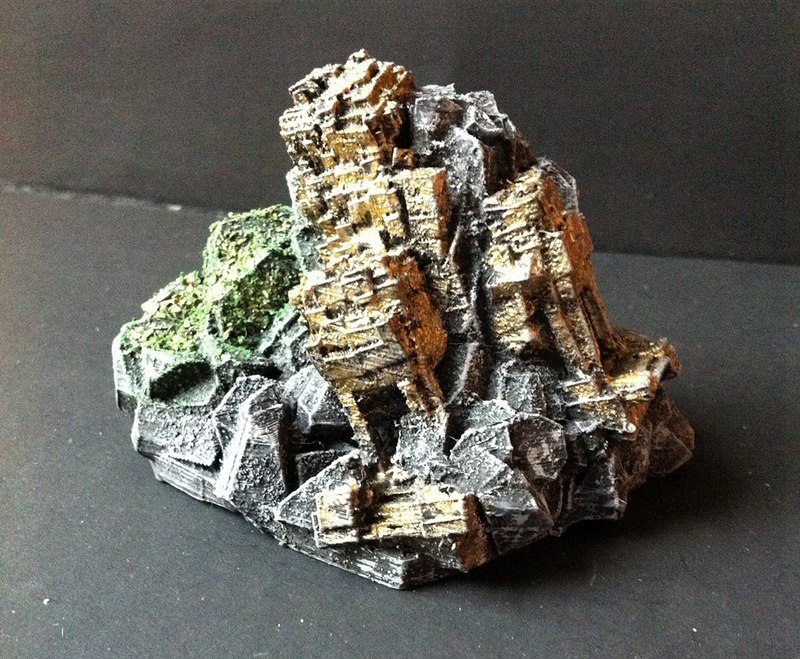 I originally wanted it to be sand stone with some plantation around but slowly transformed into the final product with dark and light grey as the base color then some sand/gold and silver on and around the structure. I cannot thank enough the people who came me tips and suggestions on reddit! And I am loving the final result and I know for sure there is a lot of room for improvement still. 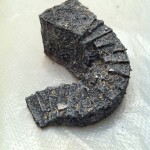 The 3D Printed Ancient Medieval Stone Stairway is approximately 3cm tall by 7cm wide by 7cm deep and available on Etsy unpainted as well as painted. A lot was done since my last post back in late January. 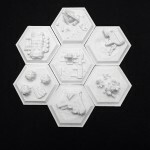 I have now completed all 7 seven custom sci-fi tile designs for Settlers of Catan. One major change to all the tiles was the redesign of the base from beveled to a more traditional straight flat hexagon. 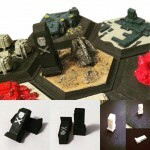 With the new design, there is a lot more surface area to place tokens and such. Besides the Desert and Hibonite Mining Facility, 6 more tiles were created – Iridium Mine, Water Pumping Station, Oxygen Extractors, Crystal Tranquillityite Mining as well as a Spaceport which acts as the port from the original game. I have also created a Space Pirate, which is the sci-fi equivalent of the robber from the original. Here’s the tiles in action for the very first time, not bad and the fact that it did not get in the way of placing the settlements, cities and the roads.The only complain is the number token covering up the tiles when placed. 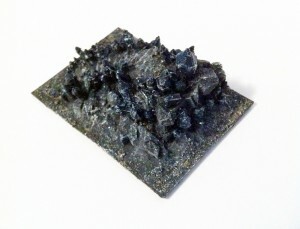 I have decided to offer these tiles in the same size as the ones from the original game as well! 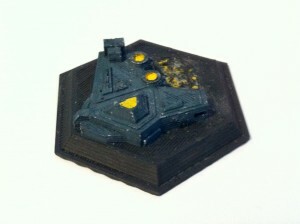 That should also make it less of an issue for the number tokens with that extra surface area. 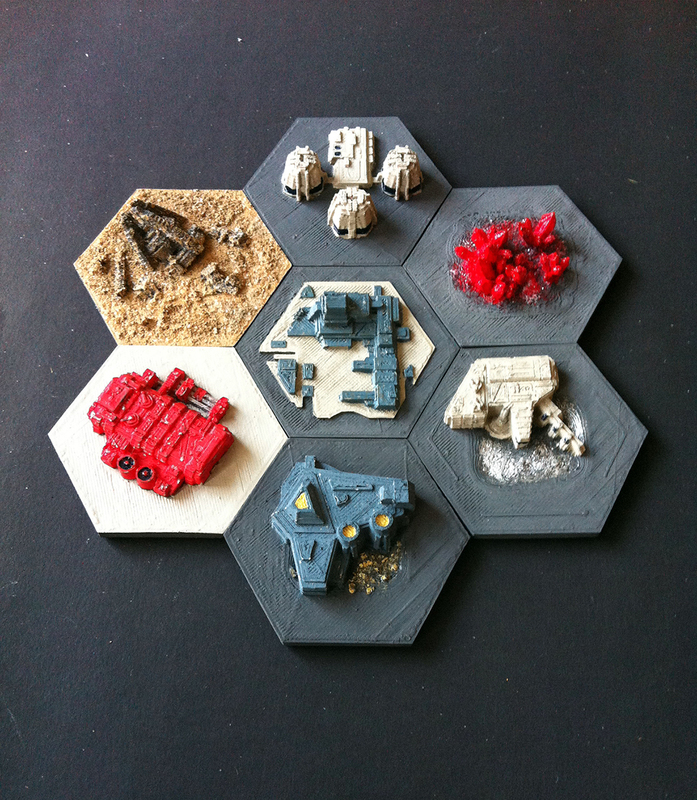 You can find and purchase these 3D printed custom sci-fi tiles for Settlers of Catan as well as other tabletop / boardgame miniatures on Etsy! Ah my first post of 2016 and let me start by saying Happy New Year to all of you! (yeah it is kind of late now that we are in mid January already!). 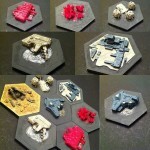 I am pleased to say that I have released two more custom sci-fi Settlers of Catan tile pieces. 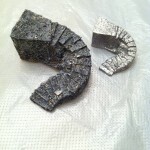 Both are minerals found in space (asteroids) that I thought suits well with the sci-fi theme of mine. 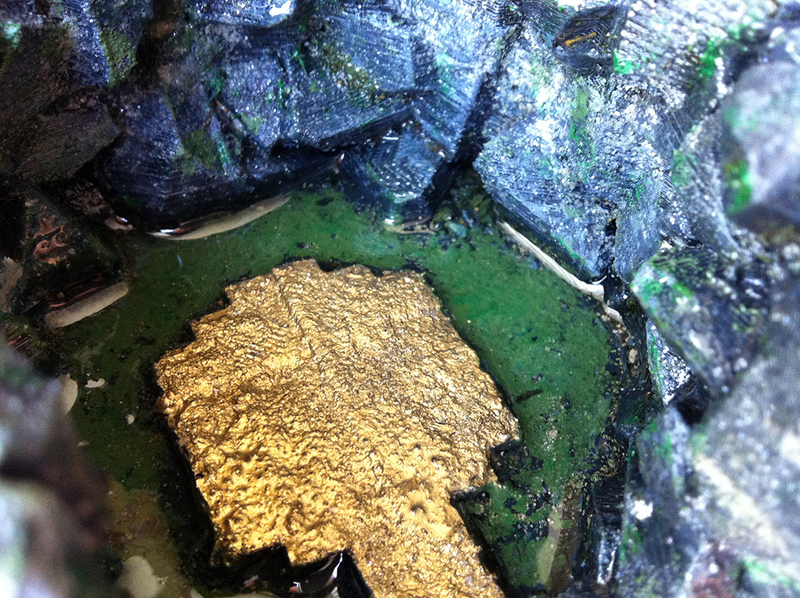 I present you the Iridium and Hibonite Mining Facilities. 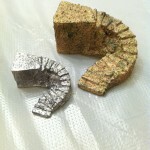 You might wonder why these two minerals out of all minerals found in space that I could choose. Well yes it is true I could have picked many others the more common gold, silver, platinum or even titanium just to name a few. But I thought these two were less common while still have shiny appearances, the Iridium is silver in color while Hibonite is brozne / brownish looking. Painting aside, I am pretty happy with the actual designs for the two structures, blocky and sci-fi-ish which are my two favorite styles. 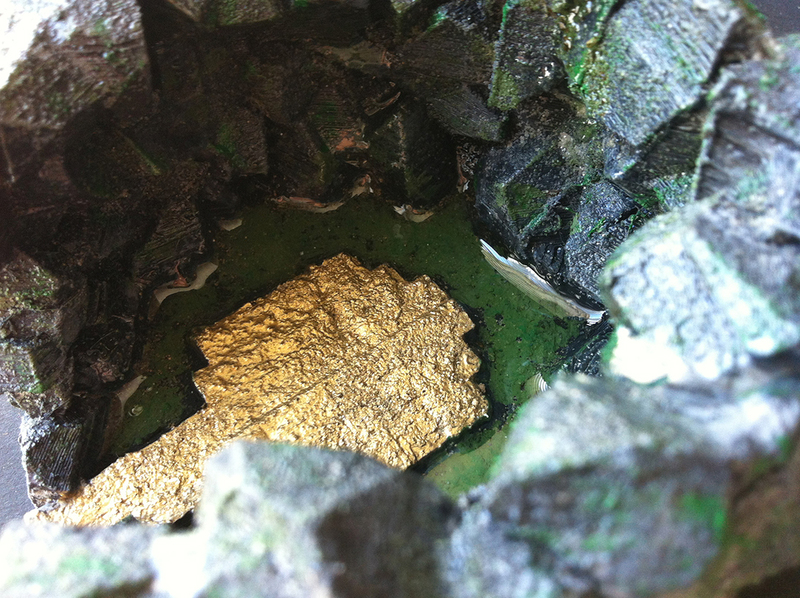 I should really repaint the yellow from Hibonite Mining Facility to bronze since that is the correct color. The other 3 designs – oxygen extractors (second design), space port (second design) as well as the hard to pronounce Tranquillityite Mining (third design!) are almost done in terms of tweaking. 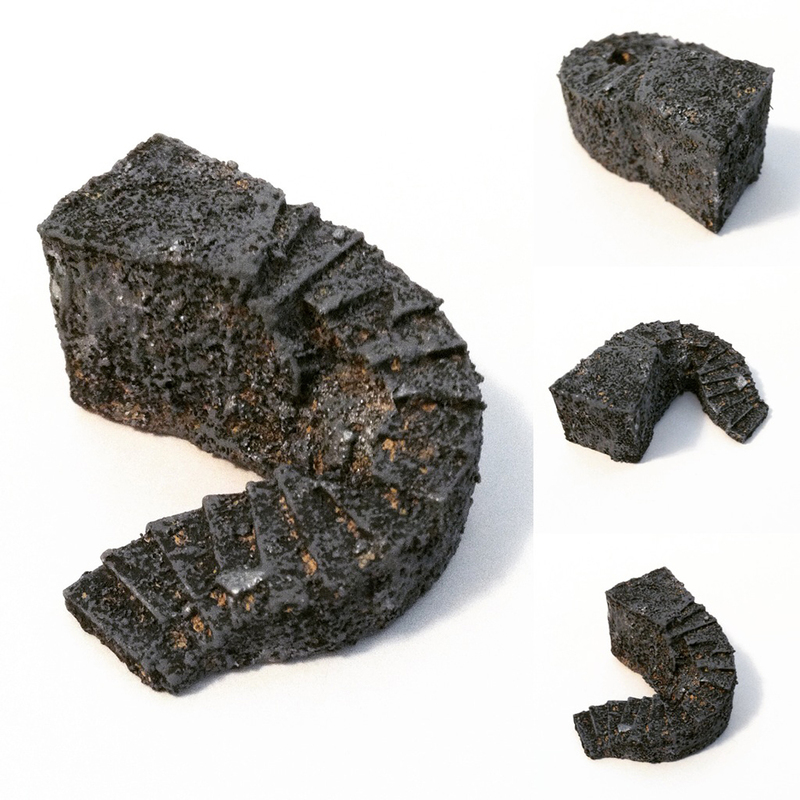 Again these are smaller than the actual tiles from the original game which are about 5.2cm wide where as the original is about 8cm wide. 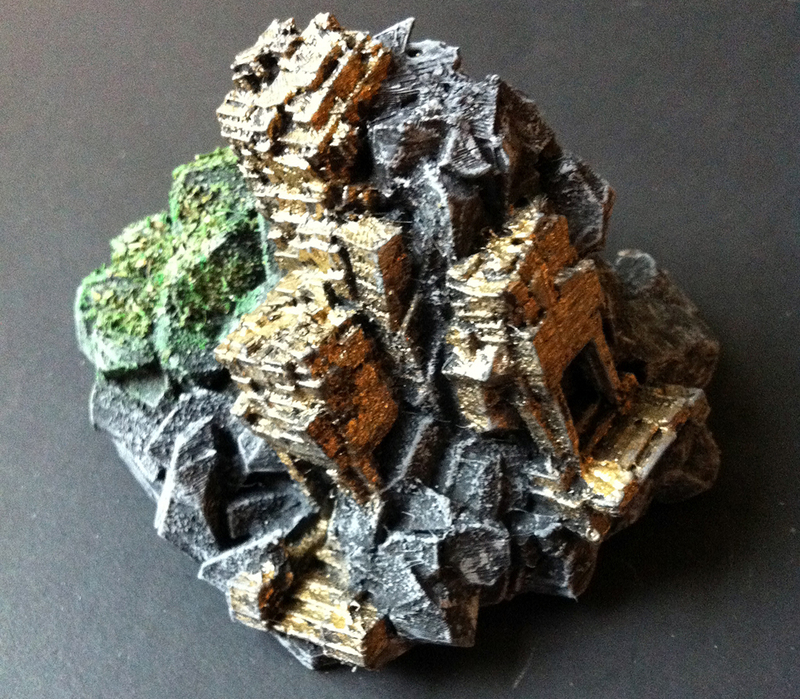 The Iridium and Hibonite Mining Facilities tabletop pieces are available in my Etsy store.